Brian Roberts. He had a tremendous regular season, and a great 14-game run through the NL playoffs, but he still doesn't get the respect he deserves. He continued his quiet brilliance in Game 1, getting on base three times and making two key defensive plays to shut down Mauler rallies. Carl Crawford. He came to the plate with the bases loaded and two outs in the 2nd and two runners on with two outs in the 4th, only to strike out and pop out. Crawford also grounded out to end the game, leaving the tying run in the on-deck circle. Crawford's bases loaded pop out in the fourth inning. Clemens was dominant after that point, facing only 18 hitters over the remaining five innings, making the Avengers' slim lead seem insurmountable. Pedro Martinez takes the mound for the Avengers, while the Maulers counter with Dan Haren. Haren was Cook County's shakiest starter, with an ERA more than 1.75 runs higher than his game two foe. Haren will need to pick up his game to avoid dropping the Maulers in a hole they may not be able to climb out of. Martinez has been beatable in the postseason, however, going just 1-3 against Ocala and Fleetwood. METROPOLIS (AP) -- Roger Clemens has been unstoppable. 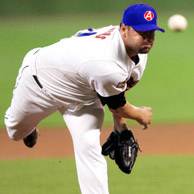 The Metropolis Avengers' ace breezed through the regular season with an ERA under 2.00, dominated the NL playoffs by going 4-0 in six starts, and has now given Metropolis a one-game head start in the World Series by throwing a complete game in a 5-2 win at the Hall of Justice. Clemens was brought to Metropolis for one reason: to win playoff and World Series games. The team has been dominant over the last few years, collecting 127 and 117 wins in the two years before Clemens arrived. Both of those teams fell short of the World Series. Clemens was brought in to change that, and tonight he continued to prove his worth. He did so during his very first time through Cook County's fearsome 3-4-5 hitters Manny Ramirez, Tony Clark, and Andruw Jones. Clemens struck all three out, the first two to end the first frame and Jones leading off the second. Superman, the Metropolis manager, didn't seem surprised by Clemens' performance. "That's why we brought him in here. He wins. I really like it because I don't have to do much thinking." Clemens did have his hiccups, though, during the second inning. After striking out Jones and getting Chipper Jones to ground out, Clemens was uncharacteristically wild, walking Johnny Peralta and Chase Utley before hitting Toby Hall with a fastball. Visibly trying to bear down to kill the two-out rally, Clemens was unable to retire Johnny Damon, who singled home Peralta with a ground ball single that Richie Sexson knocked down. Clemens recovered to strike out Carl Crawford, holding the Maulers to one run in the inning. The Avengers put together a similarly ugly rally in the bottom of the third, scoring two runs by combining two walks, three stolen bases, an error and a sacrifice fly. Chipper Jones failed to come up with a Bobby Abreu ground ball that should have ended the inning and permitted Brian Roberts to score the go-ahead run. Cook County loaded the bases again in the fourth inning, with singles by Chipper Jones, Utley and Hall. Damon tied the game by driving home his second run of the game by beating out a potential double-play ball to the right side. Unfortunately for the Maulers, Carl Crawford again ended a rally, this time popping up a hittable fastball. Clemens was on cruise control from that point on, retiring Ramirez, Clark and Andruw Jones in order in the fifth and never allowing more than a single base runner in any inning. Furcal put the Avengers in the lead to stay with his sixth inning triple to right, scoring both Melvin Mora and Vernon Wells. Mora added an insurance run in the seventh by driving a fly ball to the wall, allowing Abreu to score easily. Avengers third base coach The Flash just stood and watched as Furcal sped around the bases for his two-run triple. "Yeah, he's pretty fast, I guess," said Flash. "If it was me, I probably would have rounded third, but Rafy's slide was okay." After the game, Crawford chose to look forward to game two rather than reflect on game one. "I'm going to come through, I can promise you that," said Cook County's left fielder. "I know they don't want to see me at the plate with runners on base." In the end, the day belonged to Clemens, who scattered eight hits and three walks. He also struck out nine Maulers. Clemens was particularly tough on the heart of the Cook County order, as Ramirez, Clark and Andruw Jones were a combined 0-11 with five strikeouts. The Avengers take their 1-0 series lead into a game two matchup between Pedro Martinez and Dan Haren. At first glance, it seems obvious that Metropolis has an advantage in the World Series. After all, they did win 114 games to Cook County's 105. However, exactly how meaningful are those numbers? The Sabremetric crowd (led by Bill James, Rob Neyer, and Baseball Prospectus) have devised their own Pythagorean Formula to predict wins and losses based on a team's runs scored and allowed. While a team's wins can fluctuate based on any number of factors, the formula is remarkably effective at predicting wins and losses over the long haul. Running their regular season stats through the formula (runs scored2 / [runs scored2 + runs allowed2]) shows the teams might not be as close as their records indicate. Pythogoras shows Metropolis "should" have won 130 games while Cook County "should" have won 107. While the teams had similarly effective offenses (Metropolis scored 31 more runs), the Avengers' dominant pitching staff is the difference maker, as they allowed an amazing 158 fewer runs than did the Maulers. Of course, no one should forget anything can happen in a short series.